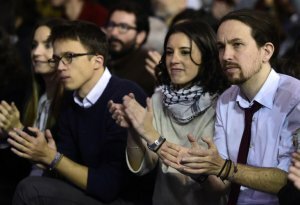 Long hailed as a beacon of success for the far-left after erupting in Spain five years ago, the Podemos party is now on the verge of a split that analysts say could hurt the ruling Socialists (PSOE). Once inseparable, the two young political scientists who co-founded the party in 2014 – Pablo Iglesias and Íñigo Errejón – have gradually grown apart over what strategy to take, and matters came to a head on Thursday. Errejón, Podemos’s high-profile candidate for Madrid in upcoming regional elections, announced that rather than run solo, he was joining a left-wing platform led by the Spanish capital’s mayor Manuela Carmena. Carmena will be candidate for the mayorship in municipal elections on 26 May and Errejón will run for the Madrid region in regional polls on the same day. Errejón’s controversial move comes after Podemos suffered a drubbing in December regional elections in Andalusia, a traditional left-wing stronghold where the far-right have made inroads and are now backing a new conservative administration. ‘This is an initiative that extends a hand to many more people,’ he told Spanish radio. Short of calling his move a betrayal, Iglesias accused Errejón and Carmena of working behind his back. ‘I wish Iñigo luck in building his new party with Manuela,’ he wrote on his Facebook page. All eyes are now on whether he will ditch Errejón altogether and propose another Podemos candidate. ‘We’re witnessing a low point,’ says Paloma Roman, politics professor at Madrid’s Complutense University. In those general polls – its first – it won 67 parliamentary seats along with other left-wing associates. Caroline Gray, lecturer in Spanish politics at Britain’s Aston University, says ‘the party has been suffering from its lack of a cohesive strategy’. ‘There have been levels of infighting between Podemos and those other affiliates over the way to go forward,’ says Gray. Some regional affiliates, she adds, would rather Podemos left them to run alone and work with them once they’re elected. If more and more of Podemos’s partners decide to go it alone in regional elections, that would add on one more left-wing candidate to those already standing for the Socialists and Podemos. ‘That will scatter the votes,’ says Roman. ‘Paradoxically, with more on the menu, more left-wing voters could turn out as each will have their own option and will know that if they all come together, they will govern,’ he says.